This spring is extra-special at the Cooper Hewitt because the garden is completely renovated and once again open to anyone who needs a nice place to sit on a sunny afternoon. 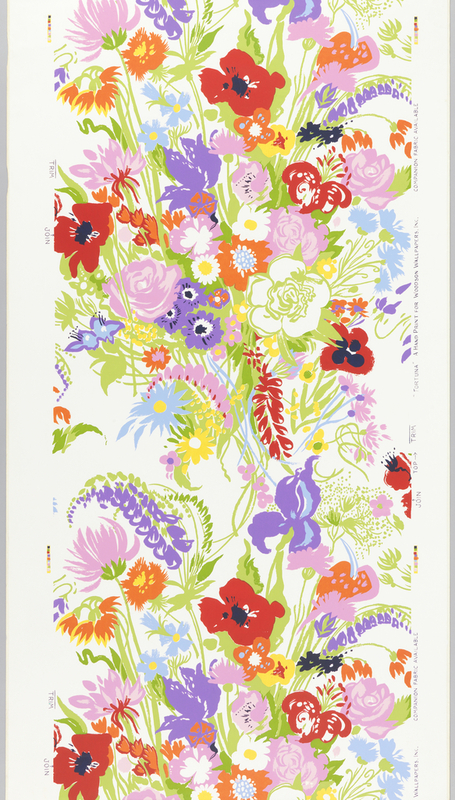 In anticipation of fun times and fair weather, we wanted to feature this vibrant floral wallpaper that presents its own take on 1960s “flower power.” Made in 1968-69, this paper is titled “Fortuna” and is more botanical than psychedelic. It shows a riot of poppies, irises, lupins, daisies and other brightly colored blossoms exploding like fireworks from loosely gathered bouquets. The flowers are rendered in broad brush-strokes in red, orange, yellow, green, blues, indigo (kind of) and violet (definitely!) on a white ground. Part of the “Hand Paint” series put out by the American company Woodson Wallpapers, this sidewall was actually screen printed and was marketed with a coordinating fabric. In fact, Woodson, founded in 1954, was known for launching the trend of displaying matching wallcoverings and fabrics within a room, and by the early 1960s the majority of their wallpapers could be purchased with complimentary textiles. The vogue for matching was so popular that some decorators went so far as to recommend hand-painting wooden furniture with the same Woodson pattern that covered their walls! Those who were a bit less artistically inclined were encouraged to just go ahead and paste wallpaper directly onto the furniture.